Escape Hunt Leeds was one of the first three venues opened by the Escape Hunt brand when they relaunched in the UK this year. All those venues have the same pair of games, but the first that we happened to be passing was the Leeds branch, so that’s where we chose to play. 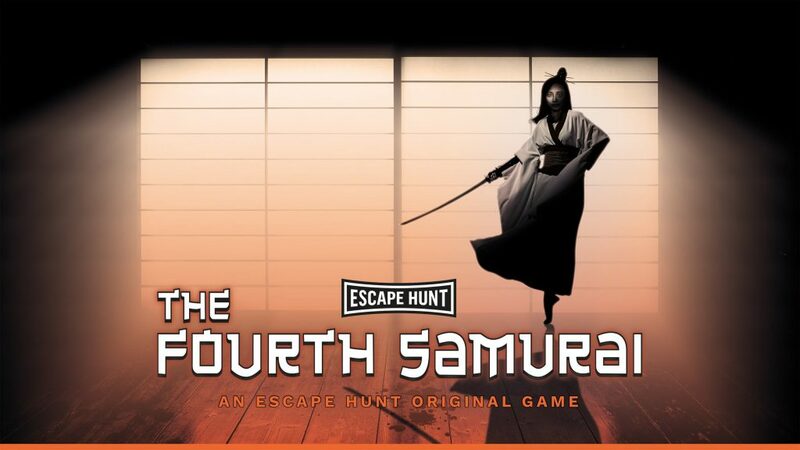 It’s worth mentioning that Escape Hunt’s first venue in the country actually opened way back in 2014 but had a poor reputation and closed down the following year. The UK renaissance comes after their admission to AIM (the Alternative Investment Market of the London Stock Exchange), and rumour had it that the additional investment had boosted the quality of their games. One thing that hasn’t changed is that they still know how to make a great waiting area: plenty of space, lots of comfy seating and good facilities. It’s clear that the corporate market is a big part of their audience and they want to create a professional feeling that many escape rooms could learn from. While you’re waiting, there are plenty of puzzles dotted around for you to try out, but it was a quiet day, so we were soon ready for our first game. The final briefing is given in the corridor outside the room before you’re blindfolded to enter the game itself. You are Japanese Samurai warriors. Your honour and your lives are at stake. You have 60 minutes to destroy a mystical sword, or a fate worse than death awaits you. First impressions were good. There’s a pretty set based on the Samurai theme that makes the game a calming place to be in. It’s not the most in-depth you could imagine, but it works because a minimalist backdrop fits the Japanese theme. It keeps that standard up throughout the game with good decoration and props. The areas we explored were more than just plain rooms, instead representing specific spaces in the building with correspondingly different characters. While they didn’t particularly advance the storyline, they did make reference to it, which shifted it from “generic Japanese space” to something specific to the Fourth Samurai. It was a relatively simple story, but I enjoyed hearing the intro before we entered and seeing the references to it during the game. Few of the puzzles really advanced the narrative, although several were metaphors for what we’d be doing on our quest. They were good, though – I enjoyed pretty much all of them with their solid, logical solutions and variety of challenges. There’s nothing here that I’d describe as new, but that didn’t stop them being fun. As you might expect given the theme, they’ve left padlocks behind and focused on more interesting ways to use “combinations” in the room. I’m not anti-padlock, but I liked the options they’d used here, which blended better with the experience. At a couple of steps along the way, they’ve effectively got progress meters to hint at how you’re doing. This is in theory a great idea, but in practice we totally missed it. That was unfortunate because, at times, the user feedback in the room was weak. The background audio was constant, and on at least one occasion we missed the feedback necessary to know we’d solved a puzzle. Worse still, the audio feedback was at a generic room level so, when we did solve a puzzle, there was absolutely no indication of what we had unlocked, and we were left backtracking through the room to work out what it might be. Per-puzzle speakers or lighting would have made a huge difference on that front. While this game is technically about escaping the room, in practice the crux of the story is completing your quest to find a particular sword. The finale presents that nicely, teasing you before you reach the true ending in a way that’s fun without being frustrating. We zoomed through that final puzzle, but be warned: I can imagine it becoming frustrating if you don’t immediately see what you’re meant to do, because there’s not much of a hint about the solution. Our team of two escaped in 37 minutes with three clues, which came over the in-room audio at just the right times. Our GM did a great job of delivering the clues in character – I don’t know if that’s standard, but it certainly added to the experience. This was a solid game across the board – storyline, decoration, puzzles and finale were all good. If you’re in the mood for a game that’s not going to push the boundaries of escape rooms but equally won’t put a foot wrong, then it’s a great choice. We played as a pair, and that worked well. For enthusiasts, I’d recommend sticking to that option or maybe going to three if you need to. More than that and I think you’ll feel frustration – the spaces aren’t huge and, while it’s by no means entirely linear, I think you’ll end up stepping on each other’s toes.